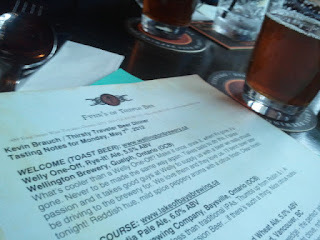 Last week, I had the opportunity to go to the Thirsty Traveler Beer Dinner at Fynn's of Temple Bar in King West. Hosted by Kevin Brauch, the event consisted of four courses, five beers, and one seasonal Oranje Weisse by Amsterdam Beer with a shot of tequila in it. Having recently decided to go vegan, and still dealing with a concussion, this was a pretty good last meat centric meal, paired with an amount of beer that my doc probably wouldn't approve of. The first beer was a one off from Wellington Brewery called Rye-It Ale at 5.5%. It was meant to be the toast beer, but no toast actually happened. That was slightly disheartening, but the beer was impressive. It reminded me of two beers: Fuller's Chiswick Bitter, and Badger Golden Champion. Low carbonation, lightly fruity, with a bitter and dry finish, it was really nice. Next up was the seasonal Lake of Bays 10 Point IPA, 6%. I'd had this in the 750mL bottle from the LCBO the week prior to having it here on tap. Preferring the draught version which was not as hoppy, it wasn't my favourite thing to come out of Lake of Bays, but it wasn't offensive by any means. 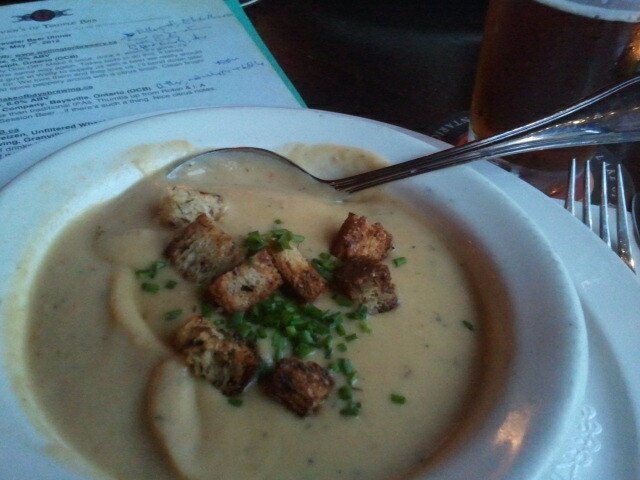 I asked Kevin Brauch why it was paired with the cauliflower cheddar soup, and after making up some reasons on the spot about how they contrasted one another, I got him to admit that it was a last minute addition to the menu. A- for effort, though. With the appetizer came Granville Island's Robson Street Hefeweizen - an unfiltered wheat ale at 5%. I'm yet to develop a proper palate for wheat beer, they all taste very similar in their lemon-orange citrus midtones to me. I was also surprised for such an event to have a Molson-Coors product on the list but, this was not marketed as a craft beer event. The hefeweizen was paired with cod cakes and ginger beet chutney. The entree was a pair of two sliders, one venison, with red onion port marmalade on a raisin walnut bun, and a bison, with scotch bonnet limo mayo and maple bacon. For me, the venison went well with the Kostritzer Schwarzbier, a vollbier dark lager from Germany. I was surprised that I really liked the dark lager, but once again, it was clear that colour does not imply taste. Dessert was crunchy hazelnut meringe layered with caramel butter cream and dark chocolate. It was a bit too rich for my taste, but I made sure to have all of the dark chocolate layers with my Spearhead Hawaiian Style Pale Ale (6%). Apparently this pale ale used to be brewed at 6.5%, but the brewery found it did better at 6%, so here we are. I first tried this beer last September, just after it launched, and I've liked it ever since. It was a comfortable way to finish off the meal, or so I thought. We all got a small glass of Amsterdam's seasonal Oranje Weisse with a shot of [I can't remember what kind] tequila in it. I'm a tequila fan when it comes to shots, and it was actually quite good in beer! The tequila rep explained that tequila is customarily had in drinks, and not on its own. The best part of the meal for me was the soup, with the venison coming up second, and Wellington's one off riding third. Thanks to Fynn's GM Robin Wynne and chef Patrick Narain for hosting a fun night.